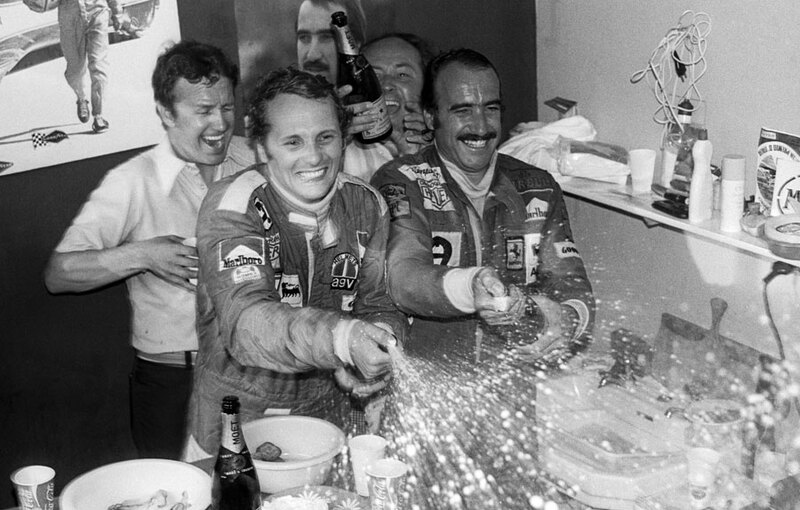 Niki Lauda secured his first world title by taking third place at the Italian Grand Prix, and the partisan Monza crowd was made even happier when Lauda's Ferrari team-mate Clay Regazzoni won the race. Ferrari wrapped up its first constrcutors' title since 1964 for good measure. Lauda went into the weekend needing only a point, and only Carlos Reutemann could catch him, but he needed to win the last two races and hope Lauda failed to score. As it was, Reutemann came fourth. There were several changes to the driver line-up, as well as the absence of Penske who stayed away following the death of Mark Donohue in Austria. Arturo Merzario replaced the injured Wilson Fittipaldi in the Copersucar, 26-year-old Pirelli test driver Renzo Zorzi took the second Williams seat in the absence of Ian Ashley, while John Surtees decided to withdraw his team from the final two races. Max Mosley, March's engineering director, was more worried how Vittorio Brambilla, who had crashed his March as he celebrated victory in Austria, would cope with the pressure from his local crowd. "We've put an extra car in the transporter," he said. "I have a feeling that by the end of practice we'll need it." As it was, Brambilla's car failed to make it off the grid. The Ferraris dominated practice, with the previous champion Emerson Fittipaldi joining them on the front row. Race day was so wet that for a time the cancellation of the grand prix was a real threat. But the rain stopped just in time. The first lap produced a multi-car pile-up at the first chicane immediately behind Regazzoni and Lauda. The initial collision blocked the track and then other cars smashed into the stricken cars. Four drivers retired there and then or within a few laps as a result. Regazzoni moved clear and then Fittpaldi chased down Lauda, who was struggling with over-steering issues, and passed him six laps from the end. Lauda offered little fight, aware it was more important to finish in the points than risk an accident defending his position. Fittipaldi duly completed his third successive second place at Monza. James Hunt, in a new Hesketh, came fifth after being forced down an escape road as he battled for third with Fittipaldi.